Facebook is constantly changing when it comes to privacy settings. Personally, I am a little tired of having to see what these changes are about and also of having to check my Facebook settings every time they want to share my information. Last week, Facebook included a set of new features that allow websites like Pandora access some of your personal information and use it to personalize your experience with their products. For example, Pandora will be now able to recommend streaming music stations based on artists you’ve Liked on Facebook. However, for those of you who are concern about privacy there is an option called “Instant Personalization” which is inside of Facebook’ privacy setting pages that would allow you to have some control about this. There are two options: you can either turn Instant Personalization off at Facebook or you can opt out at individual websites. It is important to know that your friends can sometimes share your information from their own profiles with websites even though this is turned off. 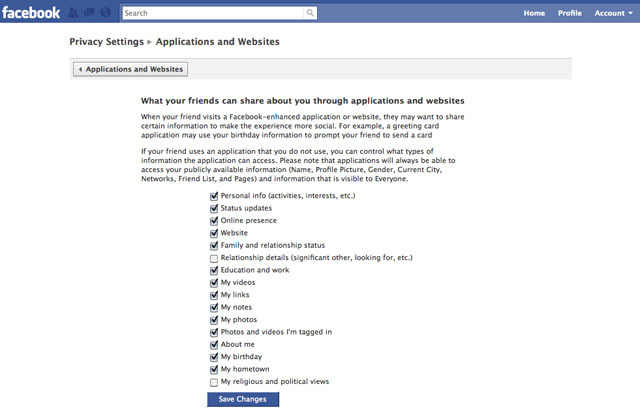 To change this you can go to “Applications and Websites” and click “Edit Settings”- “What your friends can share about you”. It’s nice to be able to choose exactly what you want to share or not. Even though Facebook frequently changes its privacy policies it is good to know you can still have a “say” when it comes to your privacy.